I'm going to mention FFXI again in this post, but it's not about FFXI. I promise! There are many systems going on under the hood in FFXI's combat. The world has a week cycle which progresses through 8 elementally-aligned days; each day lasts about 1 Earth hour. Each spell has an element associated with it, and using the skill during the element's day or the day that is weak to the skill's element will cause the spell to be more effectual. The other side of the coin is that if that spell in casted during the day that is strong against that spell's element, then the spell will be less potent. Weapons have damage types which grant bonuses or dampen damage against certain foes. Popular leveling locations at the moment are filled with Colibris which are weak against piercing attacks. Thus Dragoons and polearm-weilding Samurai are hot jobs right now. Less pervasive knowledge, but still important to those that can exploit it, the mobs themselves have a counter system. Attacking a bird with a crab wouldn't be a Beastmaster's first choice. It's not the end of the world if a Dark Knight (using a Scythe) is invited to a Colibri party or a mage casts Fire II on Watersday. These are intricate systems that provide slight advantages (or disadvantages) to those who understand and capitalize on situations. Over a long enough timeline the optimizations add up, rewarding those who are more knowledgable, but sometimes it is unavoidable--healers will still cast Cure on Darksday regardless of the 10% less potency. These systems make combat more nuanced--more mechanics to be learned and applied on the road to mastery. Spell rotations and weapons have more considations than just DPS at face value. Melee classes maintain several different weapons and use the appropriate blade depending on party composition and camp location. Monsters have more dimensions than just HP, and thus the world has a bit more personality and feels more alive. How did we let studios remove these types of systems? Was it deemed too much baggage to get on the treadmill? Too complex for plebian minds? "How did we let studios remove these types of systems? Was it deemed too much baggage to get on the treadmill? Too complex for plebian minds?" You're certainly free to blame today's supposedly stupider players for their alleged inability to grasp complex systems if you'd like. My guess is that players don't like to be told that they just wiped because the hour they were available to play today happens to be Dark Day. They're no longer satisfied with "flavor" as a justification for entire classes swinging wildly from ineffective to wildly popular based on what mobs players are currently focused on killing. You can argue that these players are short-sighted in their failure to recognize that one day they're going to win just because it happens to be Light Day, and that this flavor will make up for the time they lost because of Dark Day. Personally, I think it's more of a matter of preference - for an increasingly large demographic, game balance and accessibility concerns trump flavor each and every time. I am very much aware of the accessibility desires and concerns of the majority of players. So aware, in fact, that I am saddened by the current and future scene. I don't have the free time to play games as I did in high school either, but that doesn't mean I want games simplified and stripped of any challenge or commitment. This little gnat called Accessibility is a disease in the industry I grew up wishing to be a part of. Looking now at how genres are progressing, I'm not so sure I even want to play these games let alone make them. The only "MM" left in Diku-style MMORPGs is the Auction House. The majority want pretty lights dangled in front of their faces and score totals to raise ad nauseum. Yes, this is very cynical. But I post these write-ups of FFXI because I hope a healthy portion of comrades wake up and exclaim, "Oh yeah! What happened to all the gameplay?" And the only time the day of the week could actually cause a wipe is when you are fighting Summoner Avatars. Rest of the time it's a few extra points of damage. This type of variety started dying when Blizzard introduced a set of dungeons that were all about fire. It was called the Blackrock Mountain. Players will hate variety if the game offers them no opportunities to adapt to said variety. Like GA said above, nobody likes an unwinnable scenario. Variety needs to be paired with adaptability. For example, damage types continue to exist in Eve because all four types are represented equally and everyone can theoretically use any type. I'm not getting your point, Hirvox. BRM was all about Fire Resistance. There were a series of 5- and 10(15)-man dungeons where players accumulated fire resistance gear so that they could fight raid bosses in Molten Core and Blackwing Lair. The majority hated it because it was a linear gear grind. Personally, I think BRM is one of the best dungeon scenes in any RPG I've ever played, but I'm obviously a minority. Where is the variety? People hated it because it wasn't varied. Anyone can theoretically be any job in FFXI and wield a range of different weapons. All offensive casters get a full stock of elemental nukes. It isn't like WoW where Mages have no Nature spells, and Warlocks are devoid of Arcane magic. How come you don't seem to mind the discrepancies between classes in WoW? Tanks and healers are in high demand. Damage classes must wait longer to find a group. Similarly, tanks and healers are in high demand in FFXI as well as a few other choice jobs. If you happen to like a job that isn't popular, make the party yourself. Colibri parties are in the level ranges 37-40 and 55-60. There are plenty of locations in between where other jobs can shine. And just because a location is popular doesn't mean that there aren't alternatives. Players leveled to cap somewhere before those areas existed. Thematically? Yes. Game balance-wise? Not even close. The variety was at a higher level. Ahn'Qiraj was heavily nature-themed, and Naxxramas was ice-themed. The problem was that those dungeons were not released at the same time, nor were they at the same level in the progression tree. It isn't like WoW where Mages have no Nature spells, and Warlocks are devoid of Arcane magic. And here is the crux of the issue. Because each dungeon or set of dungeons followed a single theme, certain class/talent/gear combinations were simply subpar for months, even years. Fire mages and destruction warlocks never got their chance to shine before new dungeons were released, and by then frost and affliction started to lose their glamour. 1. Release varied content catering to different specializations so that everyone gets a chance to shine. 2. Make it easy to respec the character. 3. Increase the character's list of abilities so that there's never a situation where the character is utterly ineffective. Eve uses all three, FFXI and Guild Wars use option 2. Even WoW adopted option 2 with the dual-speccing feature, allowing hybrids to switch roles and DPS to switch damage types. I actually raided the BRM-era content as a mage in WoW. The treatment of mages in that era has probably turned an entire generation of players off of the idea of elemental combat vulnerabilities. We had an entire spec whose purpose was to do the most damage by setting things on fire, only to be told that they don't actually get to do any of that damage because the theme of the setting required that mobs be resistant or immune to fire. After more than a year of that as the status quo, it was payback time for the fire specs, and those of us who had learned to raid as frost in the mean time were just out of luck. None of the alternatives to addressing this were entirely satisfactory, so Blizzard just decided that they weren't going to do mobs with elemental resistances anymore. Having some of your DPS reduced to utility status might work in old-school EQ1 raids (with no cap on group size), but it's very hard to make this type of system work in smaller groups unless you want to trivialize the differences between classes and specs (which is also happening). It's very difficult to get these sorts of systems right without making players feel frustrated. Take the UO Moongate system for example, a nifty little bit of lore where you have to whip out your telescope to see what moongates are currently aligned. But in practice, it was a pain getting to where you wanted to go. Pre-2004 MMO's were much more tolerant of such systems. While I don't think they're out of the realm of possibility, greater consideration needs to be taken and their overall scope needs to fit squarely in the game. In Hirvox example, you'll get a better response if there's a place to grind/dungeon for each of the damage types, rather than releasing them in a linear fashion once every six months. Perhaps the problem is that WoW doesn't have as much content as people think it does. Just because I say certain melee classes are popular now doesn't mean that other classes are out in the cold. FFXI's party system has become specialized. Parties are often classified as different types of "burns". TP Burn parties are primarily composed of melee classes who focus on accumulating TP as quickly as possible in order to use many Weapon Skills. MP Burns mainly have Black Mages who simultaneously nuke down a magically weak target. There are also Summoner Burn parties where crazy AoE stuff goes on. There are options available for any of the 20 jobs in FFXI. But just because someone wants to play some funky setup like Summoner/Dragoon (Summoner as main job, Dragoon as sub job), does not mean that the game should make that spec viable in every setting. Fire spec Mages were in a similar boat in MC. You can't party in FFXI as SMN/DRG and you can't raid MC in WoW as a fire Mage. The problem though is those systems didn't really work so well. 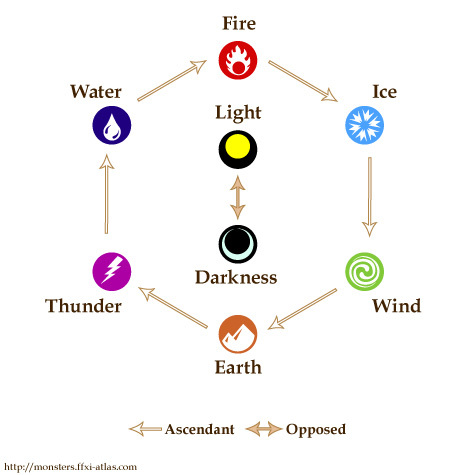 For elemental magic, it didn't matter that it was fire day and fire was stronger: you always used thunder and blizzard because the spells were seeded to be gained at certain levels and thunder/blizzard were the two strongest ones in a tier cause you got them the latest. Elemental weaponskills were worse. There was no reason to use them at all, day of the week regardless. The non-ele were all multiple hit and did much higher base damage. Weapon types seemed like a good idea, but they are less viable in practice due to FFXI's skill system. How it works is you have a base numerical rating in each weapon. This made most classes have a main weapon, with several sub weapons. A dragoon had a A rating in polearms and a B i think in staves when you balanced the numbers out. Thing is though accuracy and attack are based on those ratings directly, so using B rated staves made you give about 20-30 accuracy and attack up at max level. This is a huge amount. Also the stave has less DPS, and less powerful weaponskills. So even if you found a mob with a weakness to blunt, like bones, switching to a lower ranked weapon wouldn't help so much. The elemental/damage type system wound up in use mostly as an added gimmick to boss fights. Don't fight this boss on darksday because his drains hurt more. You need to use this type of damage when the mob changes resistance. The beastmaster thing too was less weighty in practice. If you match types, your pet intimidates them on occasion. It wasn't a big thing. It sucked if you mismatched types, but it didn't give enough benefit to choose specifically for. It added depth,but it really was optional. That's good I think because FFXI was deep enough without it. Having to swap multiple stats between auto attack and weaponskills is enough as it is. firstly, i raided MC as a fire mage just fine... this was back when damage meters had first come out.. i was always in the top 3... although i used mostly arcane abilities and was just a better overall player than most of the guys i raided with. and this is exactly how it should be... as a fire mage i still had enough variety available in my skillset that i could be almost just as effective despite all the fire resistance. the purpose of these themed areas should be to FORCE you to change up your playsyle... but the game should also make it so that it's POSSIBLE to change up your playstyle without becoming ineffective. i like being forced to play the game a little differently than what i'm used to... it adds variety and spices things up... i'd get rather bored if i never had to use anything but fireball. now if there really isn't a way to adapt and be almost as good as before... then some changes need to be made... but in the case of molten core i think blizz did an excellent job... it was the players being inadequate that was the problem, not blizzard's instance design. i think the system was designed pretty well actually because it added flavor, and depth, and made players think more... but it had a very negligible effect when everything was said and done. i guess the day system didn't really add any REAL depth, it just added the ILLUSION of depth... which is almost just as good... especially in a game with as much depth already as FFXI. Good analysis and breakdown of what's going on behind the screen of this legendary game franchise. I am continually impressed by the logic and multi-layering of FF game design.